1. A mobile oxygen concentrator has been donated to Sinjar hospital by a Doctor in Germany – thank you Dr Andreas Gammel. Thank you also to Franz Josef Hoellwarth from Austria, who responded to my urgent request by communicating the need to Dr A. Gammel. Also many thanks Franz for your continuing tireless efforts for the refugees and IDPs in Northern Iraq. 2. 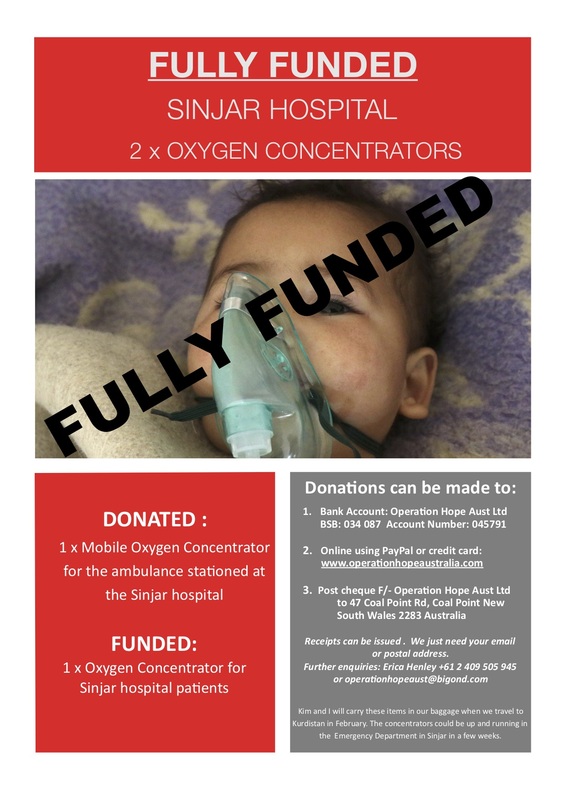 Funds have been raised here in Australia to purchase a oxygen concentrator for the Sinjar hospital. Thank you to all the generous donors here in Australia. Special thanks also to Danny Chard from Vital Resus in Newcastle for his generous discounted price. Both oxygen concentrators will be delivered and in use by March. Have a beautiful weekend my friends – wherever you are in this incredible world. Kim and I are travelling to Kurdistan in February, 2019 to help unpack and distribute the contents of the 40ft shipping container we sent at the end of 2018. I will be coordinating women’s health workshops for 1,300+ women and girls at the Bajed Kandala 2 camp. I have received an urgent request from Dr Hussein Nasser Ra Sho who works in Sinjar. The Sinjar hospital suffered damage from direct air strikes in 2014 which destroyed 90% of the hospital. The hospital has not been rebuilt and now Dr Hussein works in the emergency department which has been relocated to what was a previously a primary care medical centre. It is a small 4 bed facility with another 6 beds for critically ill patients. They have very little in the way of basic medical equipment. Last year a woman died in childbirth , small premmie babies have died being transported from this facility to hospitals in Mosul, seeking medical help. Dr Hussein needs an oxgyen concentrator for the emergency department and one for the ambulance. These are vital pieces of medical equipment that will save lives – from small babies through to the elderly. When Kim and I travel to Kurdistan we will be able to take the two oxygen concentrators in our luggage and personally deliver to Dr Hussein. So the challenge is on to raise $4,100 to enable the purchase here in Newcastle in the next few weeks. Can you help us save the lives of Ezidi people living in terrible conditions in the ruins of Sinjar? Every donation will help us reach our target in this life saving project.